Many years ago, when I came to Manhattan to visit a friend, she took me out to an ice cream place in Chinatown that she wanted me to try. I’m not sure if she knew back then how much of an ice cream lover I was, but I always have remembered my trip to this particular ice cream shop and especially the unique and different ice cream flavors they offered, especially more Asian-inspired flavors. 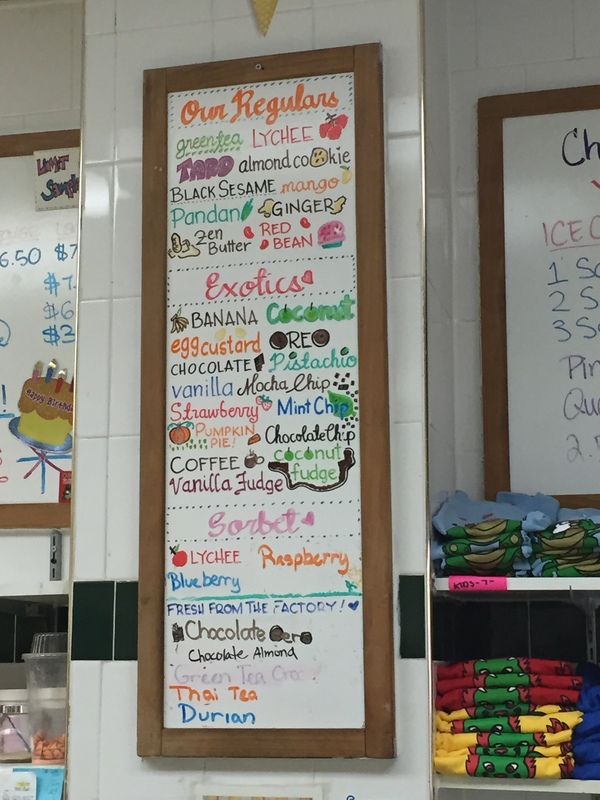 A few years back, when my parents were traveling to Manhattan, I told them to check out this ice cream joint because I figured they’d like it as well. So, when my husband and I decided to take a trip to New York, I told him we should put this ice cream joint on our list of places to eat. I knew my husband enjoyed Chinatown in New York, so we’d probably be making a stop there, why not detour just a little for an afternoon snack? 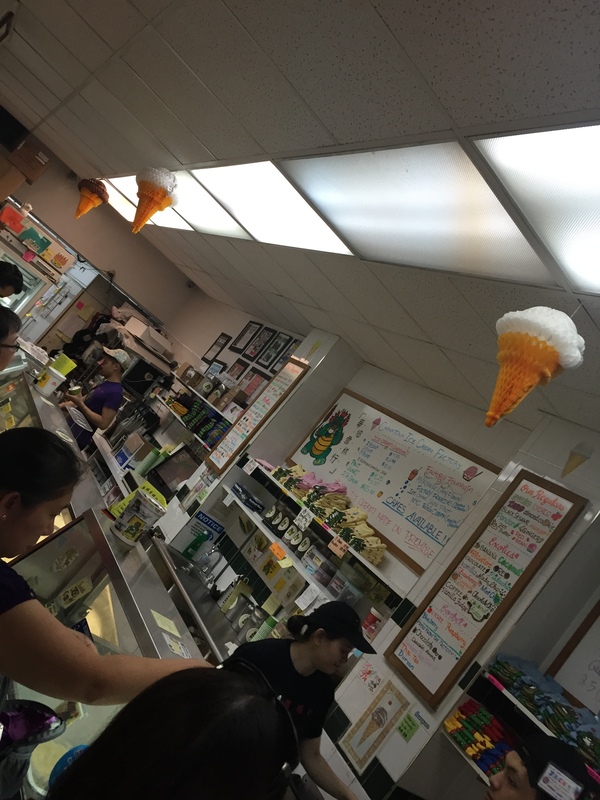 In business since 1978, The Original Chinatown Ice Cream Factory is a family-run and operated business that’s been delighting crowds of ice cream lovers for over 30 years. Operating out of a tiny storefront that’s often packed to the gills with customers, owner Philip Seid combines the art of ice cream making with an exotic Chinese twist to create one of Chinatown’s oldest operating businesses. While the origins of ice cream are vague, there are some legends that attribute ice cream to the Chinese during the time of the Tang Dynasty. Today, the Seid family tradition of ice cream making continues with Philip’s daughters Christina and Katherine. Offering up different and unique ice cream flavors that they make in house, The Original Chinatown Ice Cream Factory serves up their regular every day flavors, a category of flavors they call their exotic flavors but most people probably recognize as flavors you find in your local ice cream shop, and then other rotating flavors that make a special appearance at the store from time to time. Exotic flavors include banana, cherry vanilla, chocolate, chocolate chip, coffee, mint chip, mocha chip, oreo cookie, pistachio, pumpkin pie, rocky road, strawberry, vanilla, and vanilla fudge. Both the vanilla and vanilla fudge are made with premium Madagascar vanilla. Pumpkin pie is spiced with nutmeg, ginger, and cinnamon to emulate the flavors of Thanksgiving. Pistachio ice cream is made using whole pistachio nuts. Mint chip uses green mint ice cream with dark chocolate flakes. Cherry vanilla has Bordeaux cherries in Madagascar vanilla ice cream. Special appearance ice cream flavors include items such as green tea oreo, German chocolate cake, honey lavender, chocolate marshmallow dream, coconut pineapple, orange pineapple, peaches and cream, red velvet, rum raisin, tropical fruit sorbet, lychee rose, jackfruit, maple bacon, caramel zen butter, and banana fudge just to name a few. Jackfruit is definitely a flavor I would have loved to try. Sadly, they didn’t have any the day we visited. But there were plenty of other flavors to choose from. The hardest part is making a choice as to what to order. 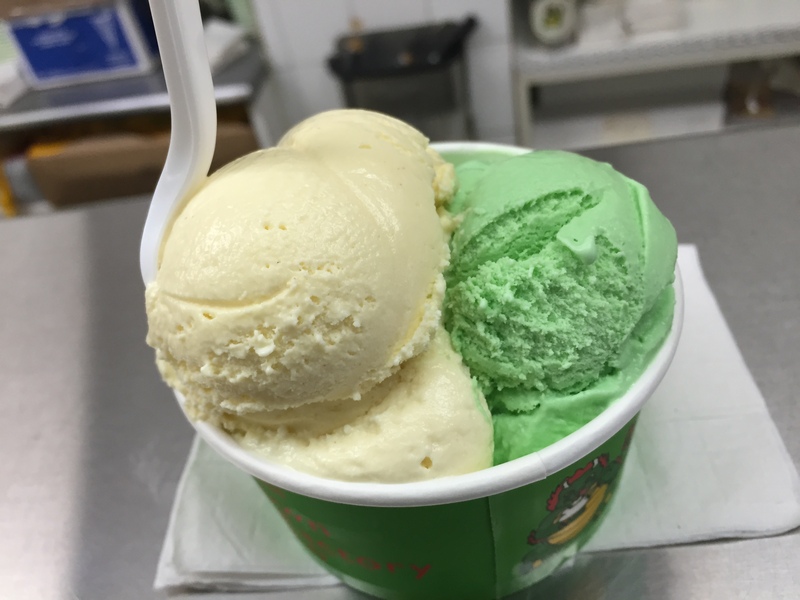 The Original Chinatown Ice Cream Factory’s regular flavors include flavors such as almond cookie, black sesame, coconut, coconut fudge, don tot, durian, ginger, green tea, lychee, mango, pandan, pineapple, red bean, taro, Thai iced tea and zen butter. Zen butter is peanut butter ice cream with toasted sesame seeds. Pineapple includes pureed pineapple pieces blended into creamy ice cream. Red bean is a Chinese sweet bean often found in desserts. Taro is a purple tuber, similar to a potato or yucca and can be used for either sweet or savory items. Thai iced tea uses the delicious Thai beverage in an ice cream format. Ginger uses sweet ginger to give a bit of a kick to ice cream. Durian, sometimes called the stinkiest fruit, is an Asian speciality that has delicious flavor. Coconut ice cream is cool and creamy with coconut flakes. Almond cookie is made with the famous Chinese almond cookie from Famous Fung Wong Bakery blended into ice cream. I decided to get a 2 scoop cup of ice cream with banana and pandan. I’m a banana lover by nature, so I couldn’t resist this delightful ice cream using ripe, delicious pureed bananas to give it a sweet flavor. My husband and I both debated getting pandan as we both wanted to try it. I decided to order it and told my husband he could taste mine so he could order something different. Pandan is a Malaysian leaf that’s often used to flavor desserts and foods. It has a bit of a nutty, and slightly sweet flavor to it. After you boil the leaf, and let it steep, you can create a syrup to make ice cream with. The green food coloring is added to distinguish the flavoring of the ice cream. I loved the pandan flavor of the ice cream. It was sweet, but subtle. If you’ve had pandan before and know what you’re expecting, the flavor you get is exactly what you’d expect it to be. Perfectly blended into a creamy, rich texture to create a unique-flavored ice cream, this was such a delight to see someone do it right. I’ve never seen pandan flavored ice cream before, and now I can’t believe that more places don’t make ice cream using pandan leaves because it seems like such a natural combination and it was so incredibly delicious. The combination of sweet, rich banana with the subtly sweet, and earthy pandan was such a perfect combination. I either was incredibly hungry, or really loved the ice cream, or both, because I devoured my two scoops like there was no tomorrow. My husband also chose to get a 2 scoop cup of ice cream. For his two scoops he chose black sesame and lychee. Black sesame was the other flavor (other than pandan) that I really wanted to try. So my husband agreed to get the black sesame so I could have a taste. Black sesame ice cream uses actual black sesame seeds in the ice cream that comes out a speckled black and white color, almost like a dirty Oreo. The black sesame seeds add a bit of crunch to the texture of the ice cream and a bit of a surprise when you put the ice cream in your mouth. The ice cream taste exactly like what you’d imagine toasted sesame seeds to taste like, a little nutty, really earthy, and just a hint of sweetness to them. It was really well done and I really enjoyed it. 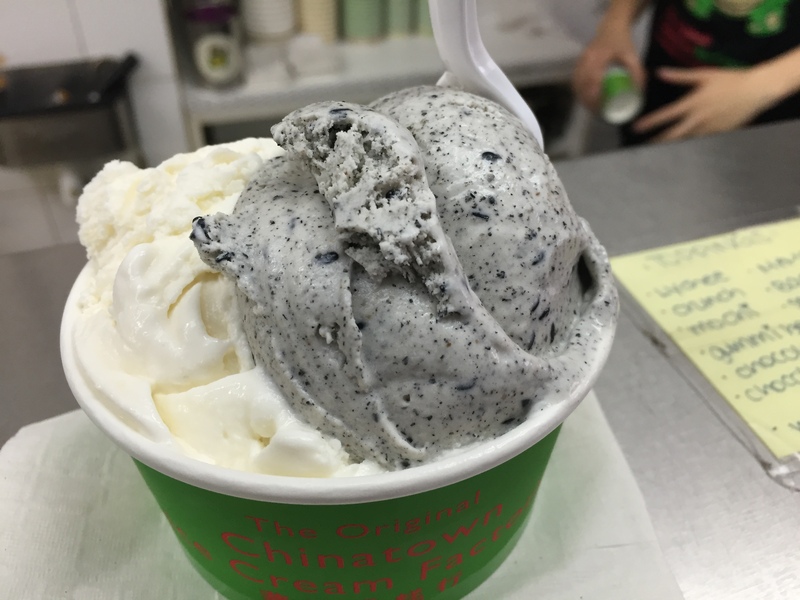 I can definitely see why black sesame is one of The Original Chinatown Ice Cream Factory’s most popular flavors. I might have stolen more than a spoon or two from my husband. Pairing the black sesame with lychee was great as the lychee was light and sweet and was nicely balanced by the more earthy flavors of the black sesame. I like that they made the lychee into an ice cream and not just a sorbet. That helped to balance the sweetness and add a nice touch of creaminess to the creation. A little fruity, a little nutty and only slightly sweet, a good combination of black sesame and lychee. The little detour to find The Original Chinatown Ice Cream Factory was well worth it. We were lucky that the store wasn’t at all busy when we arrived, as they are notorious for having lines out the door. I think we hit at a good time of the day. And considering neither my husband nor I had had a real meal in 24 hours, ice cream is the little pick-me-up we needed to get us to dinner. I love the original and creative and Asian-inspired ice cream flavors that The Original Chinatown Ice Cream Factory served up. The ability to find unique and creative flavors here that you wouldn’t otherwise find at other stores, such as durian, don top, pandan and red bean just to name a few, was a great find. I’m glad that my husband and I were both able to find something that we both liked and could enjoy. 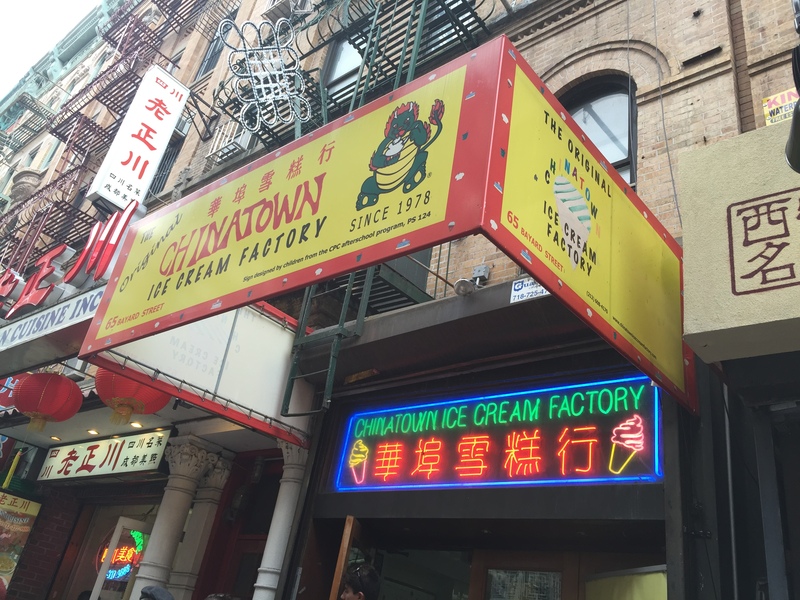 The Original Chinatown Ice Cream Factory is definitely for someone looking for something a little off the beaten path when you find yourself in lower Manhattan. Wish I had known about it on my trip to New York City this summer. Sounds amazing.